The following is 8 ton and 10 hydaulic mini clicker press which is good for mini size die cut. 1. Rotation of swing arm is flexible, and operation and materials selection is convenient. 2. High quality seamless steel tubes are adopted and processed into pillars, which are supported by top and bottom holes, to guarantee the flexible rotation and good reliability of upper beating board. 3. The switch is operated by both hands to guarantee the safety of operators. 4. 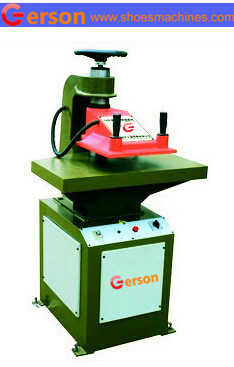 The position of rocker can be adjusted by the hand wheel at the top of machine and the cutting stroke is adjusted by timer so that the optimal cutting position can be achieved easily, the working efficiency is enhanced, and the service life of die cutter and cushion board is prolonged. 5. The inertial of flying wheel is used to store energy, which saves the energy.